The Volpino is an active, lively, confident, protective and vigilant dog. He is extremely attached to his family, and not very fond of outsiders. But with those he knows well and loves, he is sweet, affectionate, loyal and devoted. He is a quick, agile, reactive dog who is always curious and busy. He's not a dog who can be left alone in a yard; he needs fun and play-time with his family, as well as moments of relaxation with you on the couch. He's a high-energy dog who who's extremely active indoors and a joyful, happy outdoor companion who loves silly games. He needs long daily walks and chances to run free in a safely fenced area. When out walking he should always be on a leash. He will challenge dogs much larger than he is, and you must protect him from this. In general he does not get along with other dogs and pets, and is often best as an only pet. He can be fearless, stubborn, independent and strong-tempered. He is not everybody's friend, and gives his heart to his family and home alone. He's wary of strangers and can be shy or aggressive around them if not given the proper training and direction. He is easy to train and obedient, but you will need to be firm and confident to train him. He has extremely strong watchdog instincts and keen hearing, and he will bark loudly at any threat, even from a long distance. He takes his job as your "security system" seriously and may even snap. He can be good and affectionate with the children of his own family, but he may be aggressive and snap at children he doesn't know, and so must always be supervised when with them. He is an extremely high shedder, and so would not be a good pet if you dislike vacuuming regularly. The Volpino is 10 to 12 inches tall (to shoulders) and weighs 8 to 12 pounds. He has a straight, medium-length coat. His coat color can be white, champagne, or red (but the red-coated Volpino may now be extinct). Only needs an occasional brushing. If you dislike finding hair in your home you will be brushing him daily to remove it. 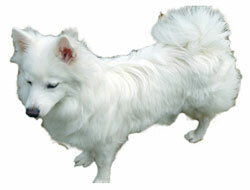 The Volpino, whose name means "Little Fox" in Italian, is descended from the ancient Spitz dog of Europe that can be traced back to Roman times. For centuries he was known only inside Italy, where he was the favored pet of nobles and artists (Michelangelo may have owned a Volpino) as well as the companion and guard dog of farmers and shepherds. The breed declined drastically during the 20th century, and by the 1960's was nearly extinct. In 1984 an effort was launched to revive the Volpino, and although he has made a comeback he is still quite rare, even in Italy. He can be found in small numbers in parts of Europe and America.